Swimming is an excellent way to get in shape, but spending time in an over-chlorinated pool is associated with certain health hazards, such as asthma. While swimming in the ocean, stay on the lookout for sea creatures such as jellyfish. Drowning is a real risk regardless of where you swim, but the benefits of swimming far outweigh the risks, provided you follow simple precautions. The physical properties of water make swimming a unique sport. Your body's buoyancy in water permits exercises that would be difficult or impossible on dry land. Unlike high-impact sports such as running, which stresses your joints, swimming is a no-impact sport unlikely to cause or aggravate joint injuries. The resistance provided by the surrounding water slows your movements and increases the difficulty of movement compared with exercise done out of the water. Water also cools your body while you swim, so you're less likely to overheat. Swimming is a social activity as well as a physical exercise. Pools and beaches provide venues for meeting new people and socializing with friends. People of all ages can participate, making it an enjoyable family activity for children, adults and seniors. Jellyfish, crabs and sharks occasionally harm swimmers in the ocean. Sharks sometimes bite humans, mistaking them for fish. Other dangers of swimming in the ocean include riptides, or strong currents that can sweep you away from shore, large waves that can knock you down, and sharp rocks and shells underfoot. The danger of drowning is a real risk for swimmers, especially children. Always keep an eye on your children when they are near pools and install a fence around your pool if you have one at home. Even if your child has a flotation device, supervise him while he is in or near the pool. The chlorine used to disinfect the water in swimming pools is a toxin that might cause asthma and other respiratory conditions. 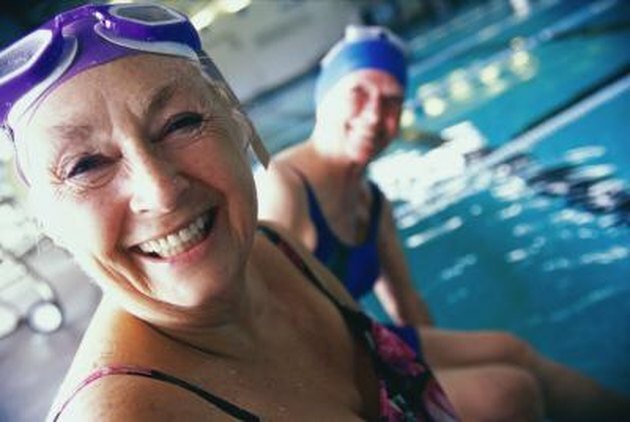 Competitive swimmers often suffer from “swimmer's asthma,” or asthma-like symptoms associated with frequent swimming. Your body absorbs chlorine both through your skin and lungs as you breathe. Unventilated indoor pools and outdoor pools with stagnant air might have unsafe levels of chlorine in the air.